1. Puralimala is situated in? 2. Largests Forest Division in Kerala? 4. Largest teak plant ‘Kannimaram’ is seen at? 5. The river which flows through Silent Valley? 6. Largest reservoir in Kerala? 7. The place where bhavani river enters to TamilNadu? 8. The peak which lies at Southern tip of Western ghat? 9. Percentage of mid land occupying the total area of Kerala? 10. Major waterfall situated in Pambar river? 11. The national highway passes through Aryankavu? 12. 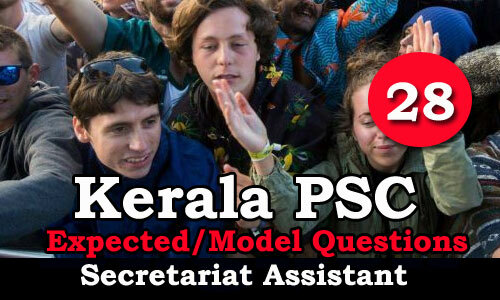 Position of Kerala in terms of area among Indian State? 13. Hottest place of Kerala? 14. The soil which does not absorb water? 15. Position of Kerala in terms of population among Indian States? 16. The only district which shares boundaries with TamilNadu and Karnataka? 17. Cholannur wildlife Sanctuary was established in? 18. The river that separates Thalassery and Mahe? 19. Second largest peak in Kerala?